I talk a lot about bullet journals and how awesome they are at keeping your life organized. But if you are anything like me then you’ve probably tried dozens of different ways to keep yourself organized and maybe you are a little hesitant to try yet another new thing? I get it! I’m always seeing ideas for new hobbies or crafts on Pinterest and think “I want to try that”! So I go out and I buy all the supplies I need… I try it once or twice but discover it’s not as fun as I thought it would be or I just don’t have space/time/energy to do it! Then I’m left with a boxful of expensive supplies! Maybe you think a bullet journal will be the same? I first heard about bullet journals about 3 or 4 years ago. They sounded awesome but I just couldn’t justify spending a fortune on something that I wouldn’t stick with. So I didn’t start one! Just over a year ago I decided to bite the bullet (literally!) and start a bullet journal! I’m now completely hooked and wish I had started sooner! You can check out my Complete Beginners Guide to Starting a Bullet Journal – I break everything down, so even a complete beginner can get started! When you first start thinking about bullet journalling you will read lots of articles and see that 90% of them will recommend the Leuchtturm1917 journal. And there is a good reason for this – it’s an awesome journal! It’s specially designed to make bullet journaling easy. But… at over $20 it can be a bit of a stretch if you aren’t sure you’re going to stick with it. The same goes for the pens and other supplies. I, too, recommend the more expensive supplies in my Beginner Bullet Journal post. If you were to buy all the suggested supplies you could spend well over $100! Of course, these supplies are WORTH it! They are all quality supplies that will make your journal look amazing and keep you motivated and organized! But… that’s still a lot of money if you’re not sure if a bujo is right for you. 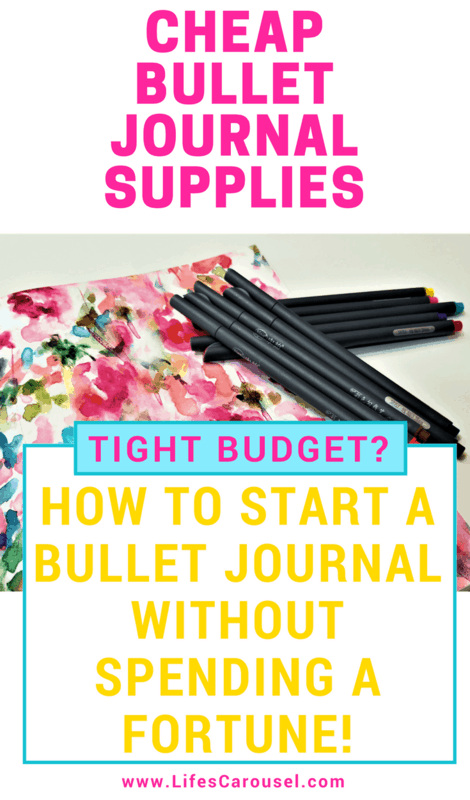 I have good news for you though… You can start a CHEAP bullet journal! To start a bullet journal you basically just need a notebook and a pen or pencil. That’s it! But there are other supplies that are nice to have or will make it easier to create fast pages that look awesome! I’m going to go through the different options of cheap bullet journal supplies with you, so you have a choice of what will suit your budget best! Of course, the most important aspect of a cheap bullet journal would be… well… the journal! As I mentioned above the most commonly recommended journal is the Leuchtturm1917 journal. But what makes it so special? Numbered pages – an important aspect of a bullet journal is the index. You will be constantly adding new pages to your journal, so an index is important so you can find the pages. The numbered pages make this even easier. Lays flat – when you open this journal to write in, it will lay flat on your desk. You don’t need to keep fighting with it as it tries to close up on you! Inner pocket – useful for putting business cards, appointment cards, receipts or anything else you need to keep track of. Page marker – a long ribbon that is attached to the spine of the journal, that you can use as a bookmark. “That’s very nice Sasha, but what about a cheap bullet journal?” I hear you ask! Well, let’s take a look at those options and compare them! The absolute cheapest option is a composition book. Yes, the old-fashioned type that you used in school! Cheap and easily available – especially in the summer in the Back to School sales. You can pick them up for under a dollar a piece! Thicker paper – the paper is designed to be written on both sides with ink so your pens won’t bleed through to the other side. Good length – they tend to be at least 80 pages long, so lots of space for all your awesome bujo ideas! Lined pages – the pages are lined and not dotted. This isn’t a big problem, it will just make some of your designs look different to the ones you see online. Not flat – composition books don’t like to lay flat when you are working in them! After a lot of use, they will, but to start with they try to close up on you as you’re writing. No page marker – there isn’t a built-in page marker to help you keep track of where you are up to. One size – there’s only one size option, which I personally think is a bit too big to carry around in your bag or purse. Ugly – to be very blunt… composition books are ugly! There are quite a few reasonable priced dotted notebooks out there. Amazon has an awesome selection of different colors and sizes, most for around $5. Dotted pages – as bullet journals grow in popularity there are so many dotted journals available. The dotted pages make it so much easier to create free-flowing designs. Size & color choices – There are dozens and dozens of color and size choices on Amazon right now! I love the one with the turtle above! They are available in small purse sized or larger desk-sized journals. My tracker journal is a larger one as I like to have space to do large tracker spreads. Page marker – some have page markers, some don’t. Page numbers – some have page numbers, some don’t. Paper quality – cheaper journals often have thinner paper and your pens might bleed through the paper to the other side. Weak binding – Some cheap journals have weak binding and might all apart with repeated use. The Minimalism Art bullet journal, available through Amazon, is an awesome alternative to the Leuchtturm1917 journal. They have the same great features but at a much cheaper price! Love cheap bullet journal supplies! Dotted pages – the same as the “cheap” option, these journals have dotted pages. But there is also the option of plain, ruled and squared! So many choices! Color & size choices – just like it’s pricier competition, these journals come in an array of different colors and sizes. I love the sky blue! Elastic closure – these journals have an elastic band that wraps around the outside to keep them shut. Very useful if you are toting it around in your bag all day. Page marker – they have the ribbon page marker, a must-have in my opinion. Accordion pocket – these journals have a large accordion pocket in the front to keep things safe that you don’t want to lose! You can also throw some of your bujo supplies, like stickers and stencils, in there! Paper quality – the paper quality of these journals is excellent for such a low price. Most pens won’t bleed through. Lay flat – these will lay flat when you are working on them. Binding… maybe? – I haven’t had any problems with the binding, but there are a couple of reviews on Amazon that say the binding didn’t hold up very well. So maybe you’ve decided to use a composition book as your journal, but you still want some of the features of a more expensive journal. This is my quick guide on how to overcome the issues with cheap bullet journals. A page marker/ribbon is super helpful to find your place in your journal. Otherwise, you will be flicking through it each time you use it to find where you are up to. Use a bookmark – yes, you can just use a regular bookmark! Use a binder clip – I love the cutely patterned binder clips and find they are super useful to clip on my bujo so I know where I am up to. If you are carting your journal around with you, then it’s useful to be able to close it so it doesn’t get dogeared. Use elastic – Simply get a length of elastic that is just under twice the height of your journal. Sew the two ends together to make a loop and use that! Use a binder clip – my favorite trusty binder clips to the rescue again! Just use a binder clip to keep the whole thing closed! Use an envelope – you can just tape an envelope into the front. Done! Use fancy card – you could make your own by folding a fancy piece of scrapbook card into an envelope shape and tape that into the front. It will look prettier than an envelope! My mother used to say “you can’t fix ugly”… but you can! 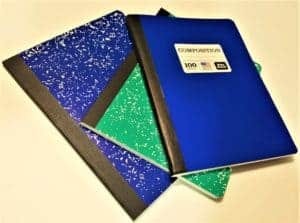 If you decide to use a composition book but you don’t want to look like you’re still in high school, then you need to pimp it up a bit! Use wrapping paper – you could find a scrap of pretty wrapping paper to cover your notebook. Use scrapbook paper – same as the wrapping paper. Find some pretty scrapbooking paper that you like and use that to cover it. Use brown paper – just like in high school, you could cover it in plain brown (or white) paper and then decorate it with your own drawings, quotes, stickers or anything else you can think of! With a little bit of creativity, you can overcome any problem (that applies to life as well as bullet journals!)! There are so many options for pens with a bullet journal. The most popular are Tombow Dual Brush Pens, but at a minimum of $17 for a pack of 10, they are a bit too expensive for most beginners (or even most experienced bujo-ers!). Brush pens are awesome for getting some amazingly artistic designs and hand lettering… if you are artistic! I’m not very artistic (I like to say I’m “creative” instead! ), so they really are a waste of money for me. My bujo friends will be crying to hear me say that! The other popular type of pens are the Staedtler Fineliners. These are a little more reasonably priced at about $20 for 36. These really are very good and I do highly recommend them… but they still aren’t exactly budget friendly! Yep, if you really want to start a cheap bullet journal, then you can start off with a regular rollerball pen. Hell, you can even get them for free from local businesses! Can’t get much cheaper than that! You are limited on color choices though, normally it’s just black, blue and red. But you can still be creative with those! If you want to add a bit more color to your journal then you can use regular old school supplies! Yep, why not break out your old crayons, markers or coloring pencils. All of them will give you colorful pages that you can be proud of. Just be careful, as some markers will bleed through even the thickest paper. A different cheap option for pens is fineliner pens. Again there are lots of brands to pick from, but I really like these Fineliner Color Pens. The colors are bright and the tips are fine enough for detail work. At just over $10 for 24 pens, they are pretty reasonably priced. However, they can bleed through thinner paper, so you can’t be too heavy handed with them. If you want to try out brush pens and see if you like them. Then Amazon has a few different options that might work for you. The Immersive Color Dual Tip Brush Pens are dual tipped just like the Tombow pens, but about $14 for 24, they are much more budget friendly. I love the dual tip, as I can use the thin end for detail work and then the brush end for lettering and coloring in larger areas. 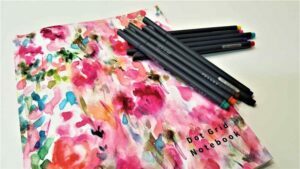 Now we’ve talked about the basics you might want to up your bullet journal game and use some other supplies. There are literally thousands of products to pick from. It is so much fun to waste hours looking through Amazon and other sites to find cool accessories and supplies for your journal. However, you DO NOT NEED these! But… if you do want to fancy-up your journal a bit, here are some budget-friendly options! Do you have any tips for creating a bullet journal on a tight budget? I’ve love to hear your ideas – share them in the comment section below! Top 5 Breastfeeding Problems and How to Solve Them... FAST! You’re welcome. I hope you found it useful. Hi Julia. You’re right bullet journaling is very relaxing. I’m not at all artist, but I still enjoy it. There’s plenty of ways to create beautiful pages without being an artist! Make sure you check out the school supply section to find grid paper. Otherwise you can print grid paper at http://www.printfreegraphpaper.com/ Hope this helps. You can get a composition notebook with grid paper! I have grid paper in my journal and it works great. WOW, great tip Jill. Thank you. I had forgotten you could get those. My first bullet journal was grid paper too, I loved it. Oh thank you. Do you know if I can get it for 81/2 × 51/2 ? Hi Jill. You can get 8 1/2″ by 5 1/2″ bullet journals. Amazon has quite a few (I got a pretty one with watercolor flowers on it for under $10 – but the paper is very thin). Also Michaels craft store has cheap bullet journals, and they have a larger size. I don’t remember the price, but definitely under $10 (and use your coupon!). Michaels has every day value dotted journals for only $5.00. They have table of contents pages at the front, two ribbon bookmarks and elastic to hold the journal closed. They come in a variety of colors and are 6 by 8 inches in size. 249 pages. The pages are thin and I have not started my journal yet so I am only guessing that the marker may bleed through on the page. I thought this would be a good option for trying out bullet journaling. Great tip, thank you. I’ll have to check them out.